Calling all beings from the 3rd dimension, this Halloween you are invited to experience a one off event taking place somewhere between this dimension and the 4th. A sensory phenomenon; a den of rays, beams, and reflections. On the 27th of October, somewhere beneath the streets of Hackney a tesseract will open. Through this portal you, earths mightiest dancing heros will pass for a night of audio-visual worship. Leading you on this epic quest we are beaming in the Space Dimension Controller (Live), an intrepid multi dimensional traveller who will be armed with a futuristic array of sounds, warping you between realities. His co-pilots will be intergalactic acid house gatekeepers Paranoid London, who will be preparing a rare and special DJ set fit for an adventure of this proportion. 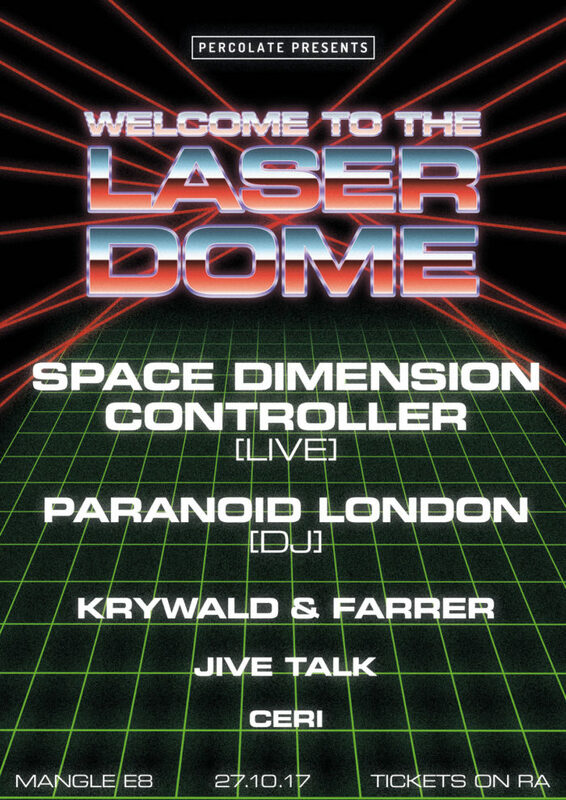 Residents Krywald & Farrer and Ceri will be setting the tone, soundtracking your kaleidoscopic laser-fuelled journey. Meanwhile, support comes from everyone’s favourite mysterious time travelling hillbilly duo, Jive Talk. Our Halloween parties are always in high demand and have sold out in advance the last three years in a row, we have chosen the most intimate space so far this year so we expect this party to be the same, make sure you get your tickets early to avoid disappointment. The dress code is optional but seriously, it’s so much more fun if everyone makes an effort! As always we will be creating an album to showcase our favorite costumes from the evening and giving out prizes for the very best. We’ll drop some ideas in the build up for anyone that needs a dose of inspiration.